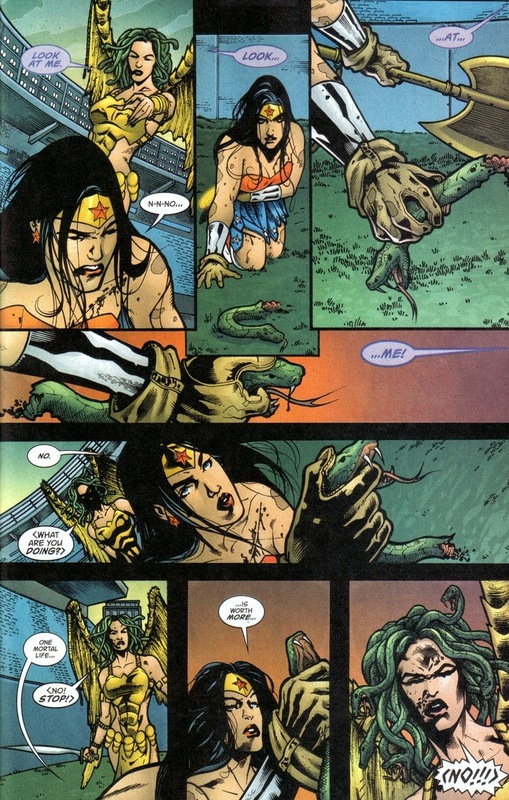 Picking up right where we left off, Wonder Woman’s pissed and ready to ruin Medusa for turning a young child to stone. 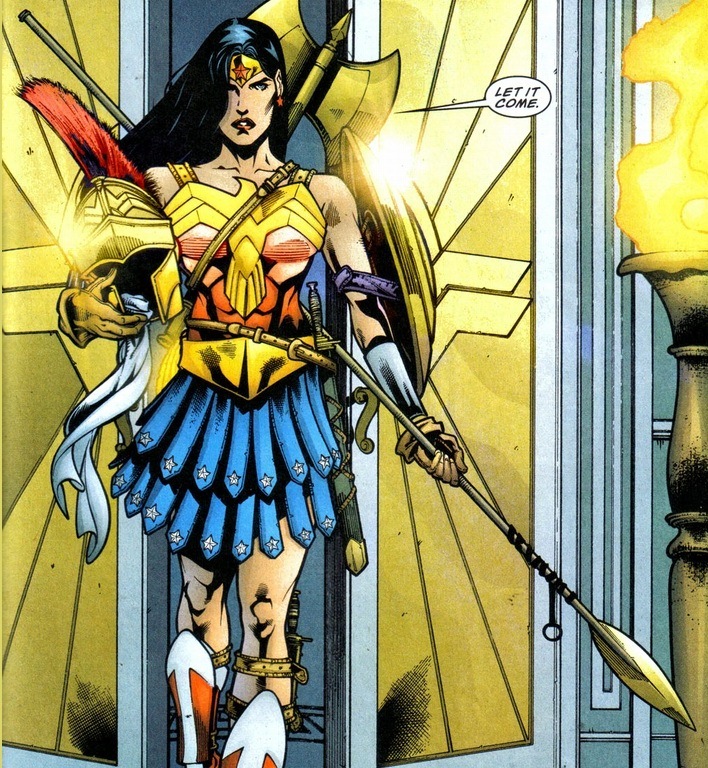 Now, many things incur Wonder Woman’s ire: injustice, suffering, pants. But killing innocent youngsters? Athena’s champion ain’t going to take that. Look, a reasonable person might ask, why won’t Superman just rush in and throw Medusa into the sun? 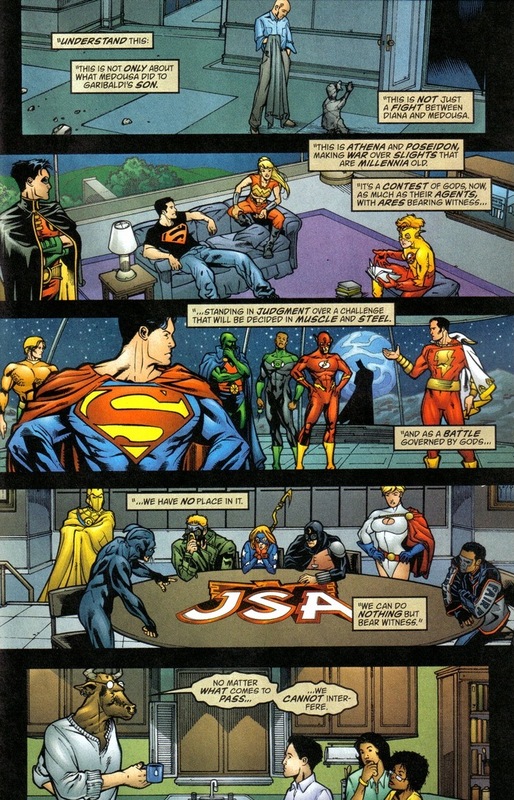 Well, Superman doesn’t kill, you jerk. And also, petty squabbles between gods have pretty strict exclusion rules. 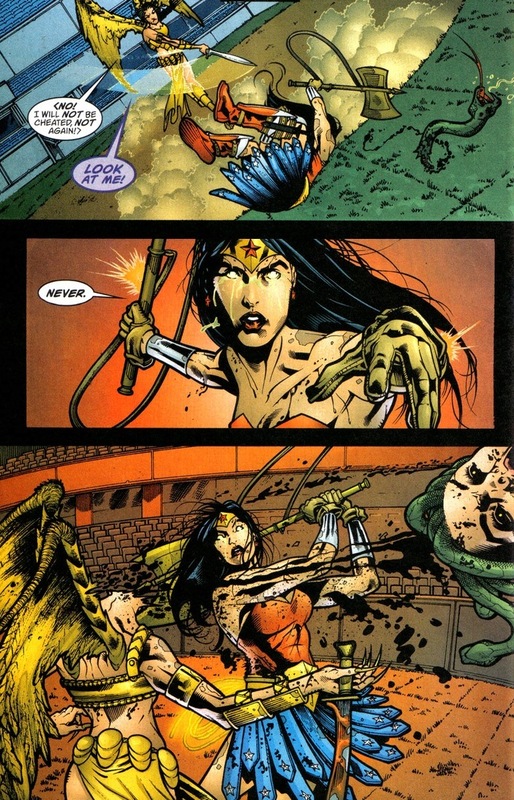 If you wish to judge the two opponents’ skill, Wonder Woman may possibly be the finest warrior in the DC universe, especially when you give her useful stuff like swords. 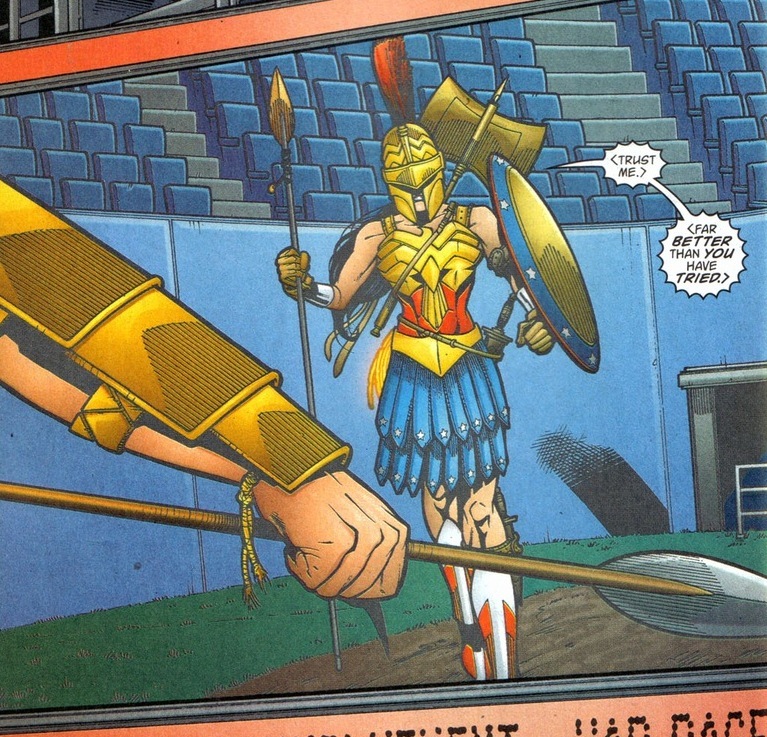 Medusa certainly doesn’t have a shot of winning this in a fair fight. But we all know nothing’s fair about this fight. Especially that one advantage where Medusa will be able to actually see her challenger. Nothing beats formal trash talking. I adore it. 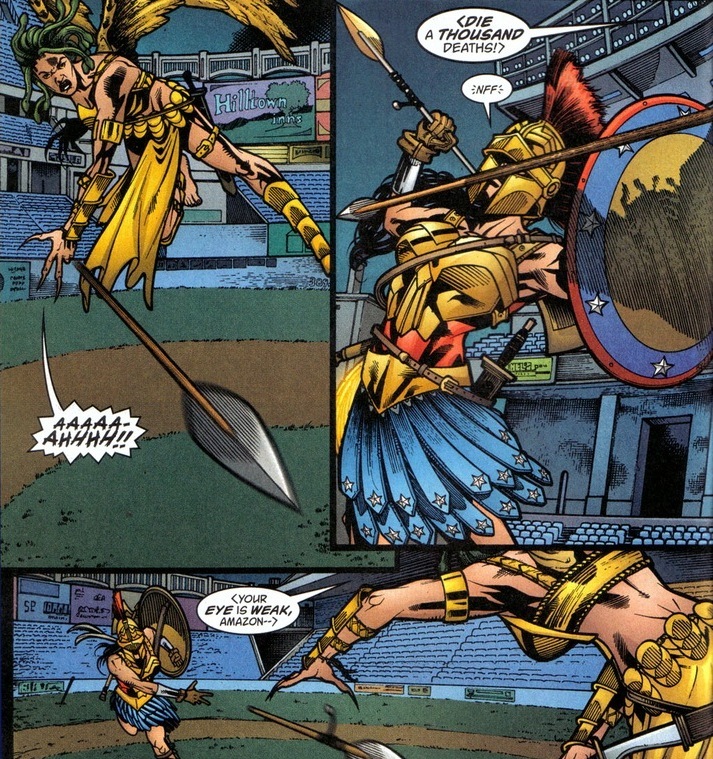 Also, thanks to Circe’s magic, the brawl on the baseball diamond gets televised to the entire world. So I can’t show you every panel of the fight. I think that violates some fair use laws and the whole point of this blog is for you to buy more comics anyway. But I’ll happily show you some highlights, because I care about you. 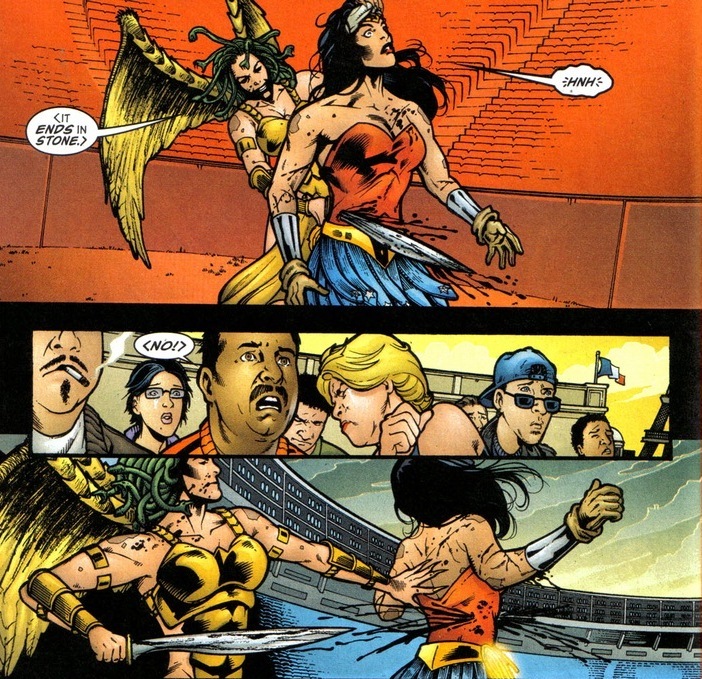 You know my favorite part about Wonder Woman’s taunting? 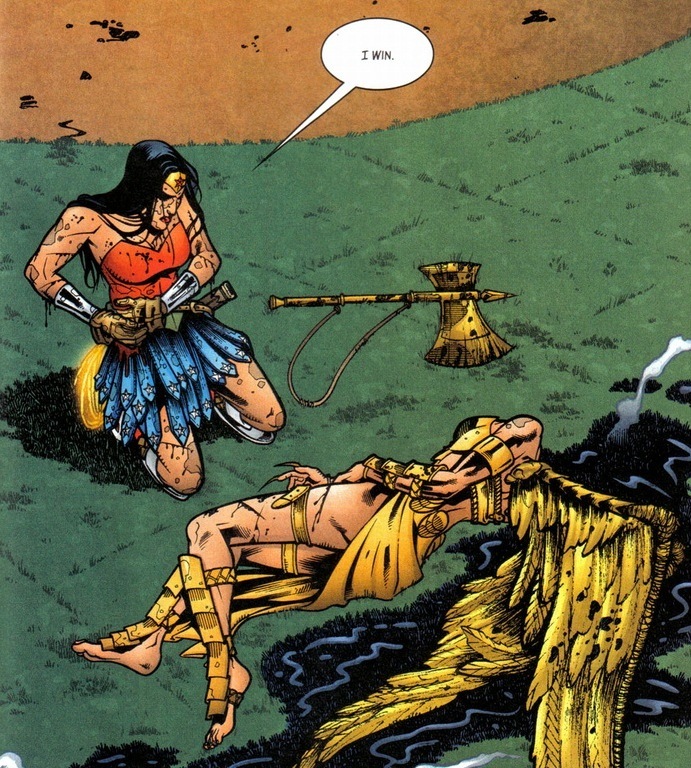 She doesn’t even know what damage she just inflicted on the gorgon. 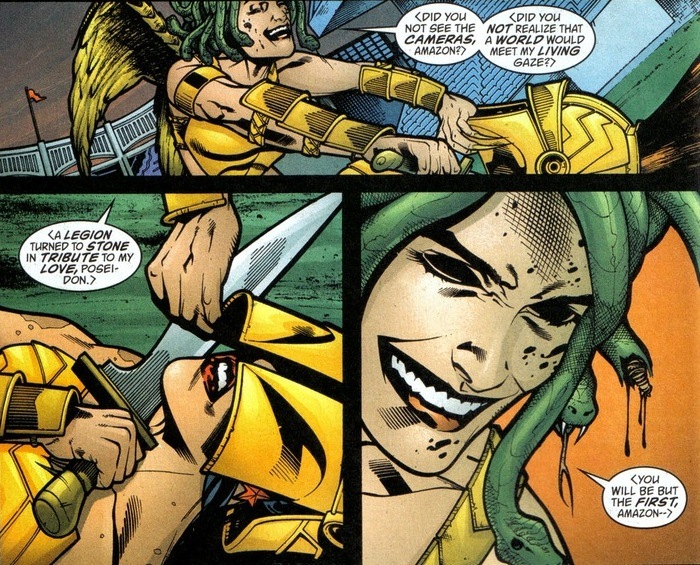 She hears Medusa’s scream and then mocks her. 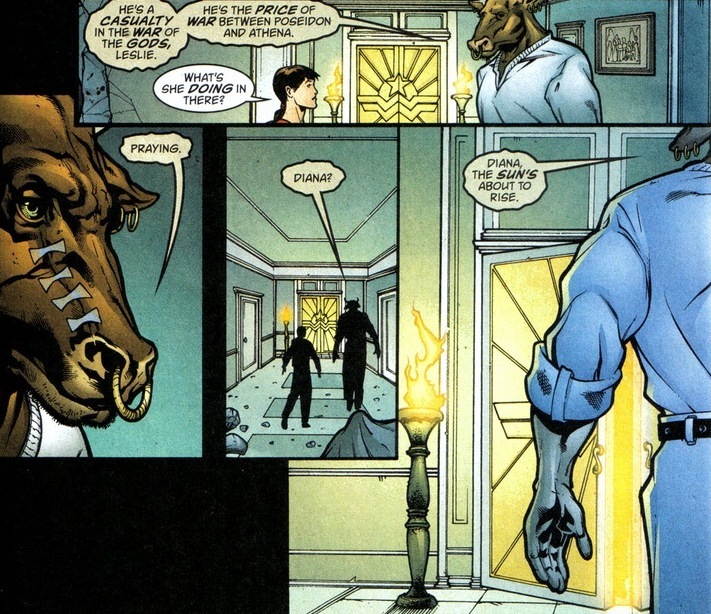 Batman would also that too. 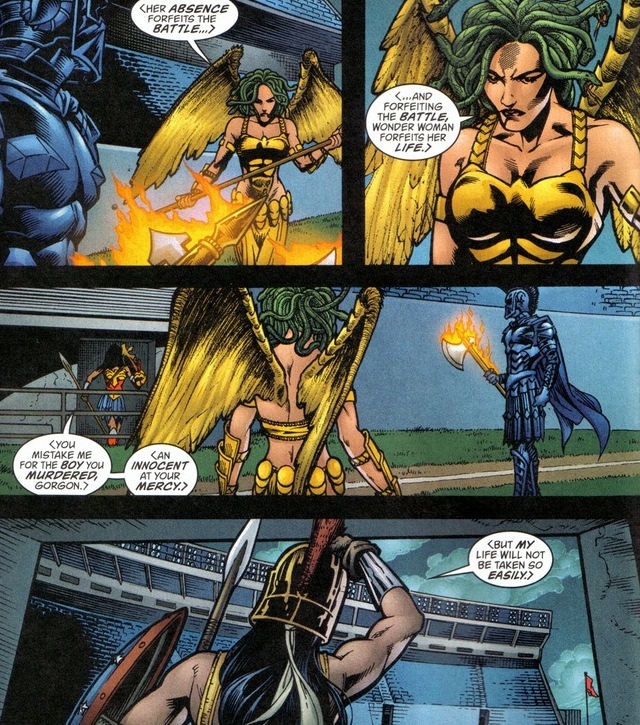 If Medusa wins the fight, she plans to be Poseidon’s pawn and turn enormous amounts of people to stone. That’s just what mean people do. 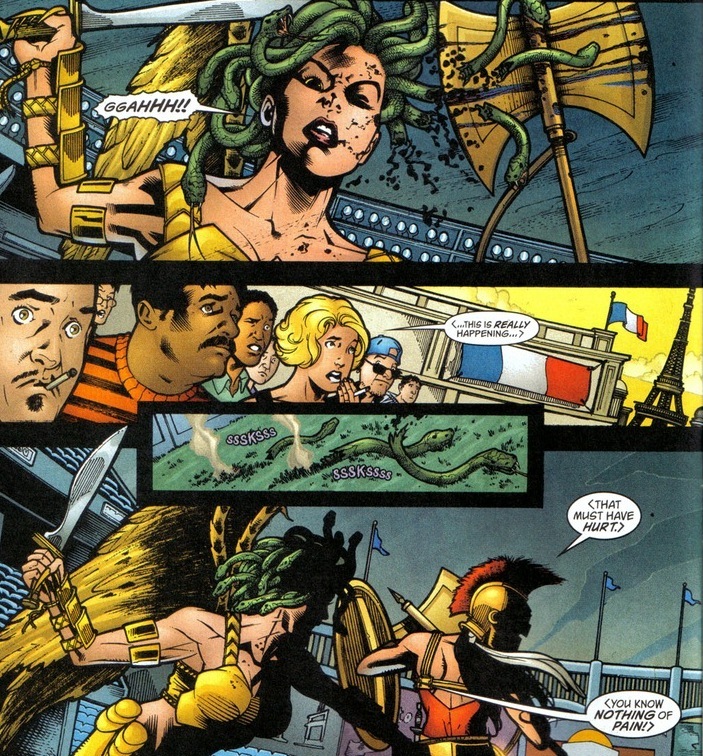 To be fair to Medusa, I would also lose the majority of my mercy and good-natured attitude if I was turned into a hideous monster because Poseidon decided to crash into my bedroom and, uh, suspend my license. I’m not really good at analogies. Do you enjoy mythical beasts getting pummeled by beautiful, strong-willed role models? Now the moment of triumph still eludes our hero. 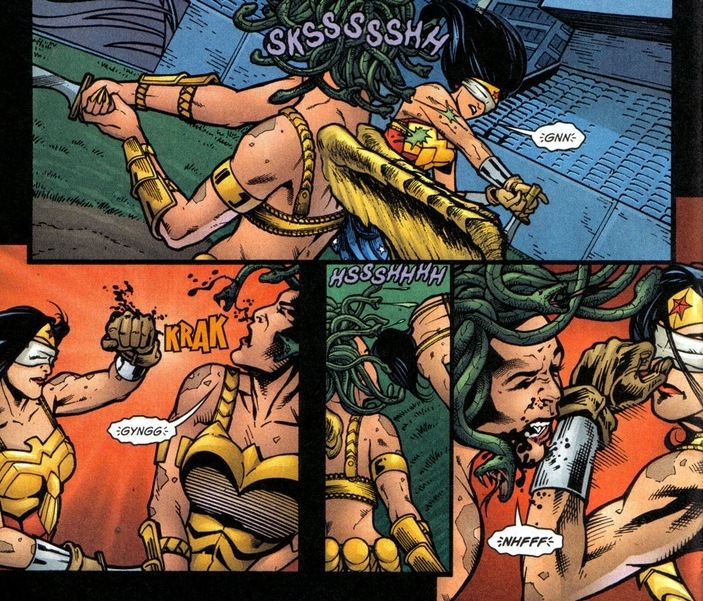 Not just because Medusa can take a punch. Y’see, when you fight blindfolded, your offense may still be pretty solid, but the defense tends to suffer. I’m not a scientist or anything, but I imagine seeing attacks usually helps dodging them. I don’t know if you noticed, but sometimes when Medusa speaks, her dialogue bubble turns purple. 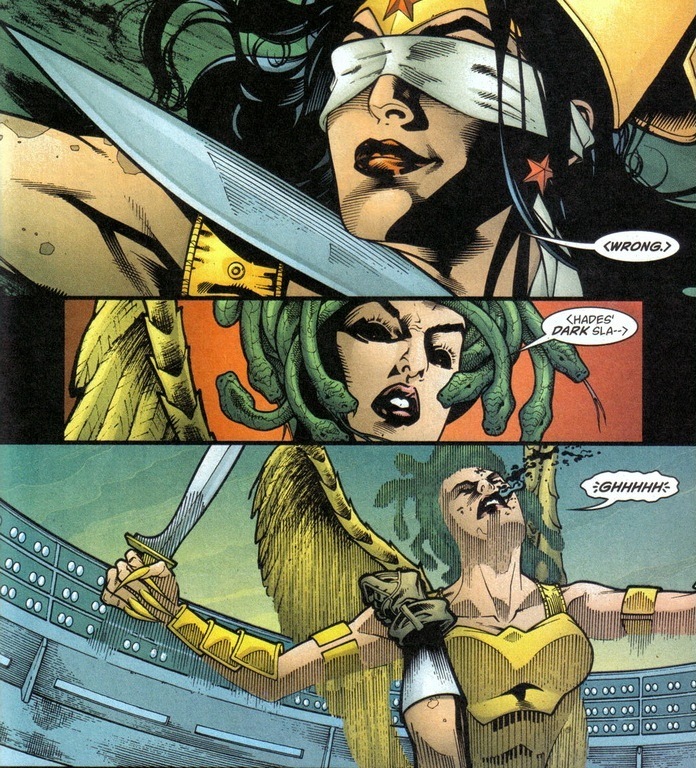 Along with snake-hair, stone vision, and awesome wings, Medusa also has a magical power that compels people to stare at her against their will. 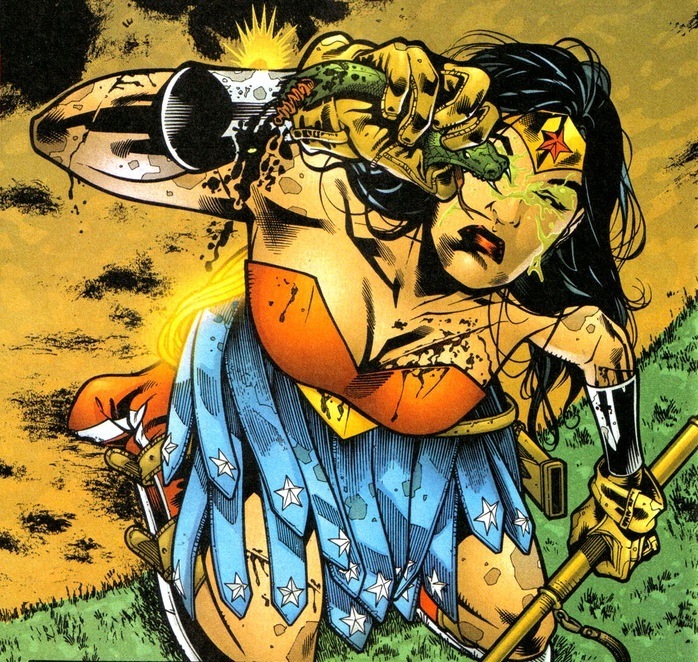 With no more blindfold, Wonder Woman has to take drastic measures to prevent that magic from doing her in. And I do mean drastic. The gods, unwilling or unable to fight their own battles, have crippled the greatest of their mortal soldiers in their silly arguments. Such is fate. Such is the cost of dealing with gods. Terribly sad conclusion, but I do make a promise: everything bad you’ve just witnessed in this arc ends happily. Eventually. It takes another good dozen issues or so, but the resolution is joyful and satisfactory. And that’s good, because I’m a big fan of happy endings. 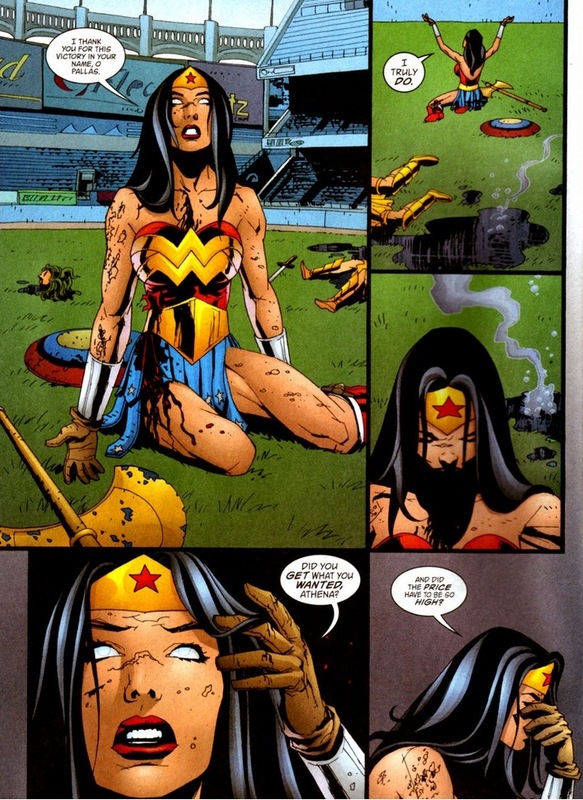 So Wonder Woman killed a villain in front of a bunch of witnesses and television cameras… and every one is happy. 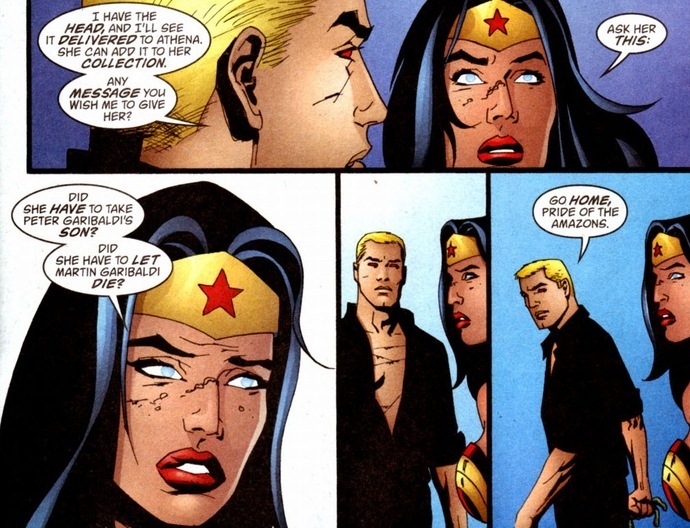 Good thing DC decided that when she did that same thing to save the world and specifically Superman she needed to be punished. Kill Medusa, fine. Kill clean cut, well groomed Max Lord, and America loses it’s mind.